Set In Stone But Ever-Changing: Sculptures Reshaped By The Tides It's tough to see Jason deCaires Taylor's sculptures firsthand — unless you have scuba gear. Most of them rest under the sea. 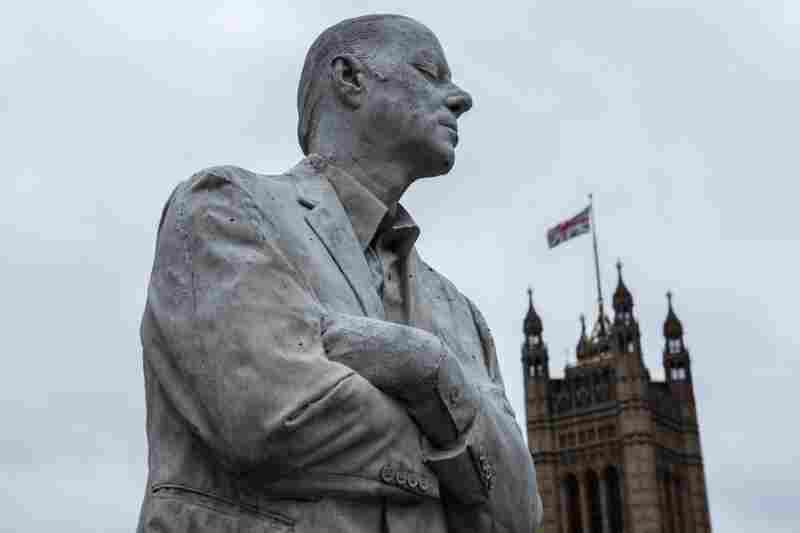 His latest work is fully visible only when the tide of the Thames recedes. The Rising Tide, on the shore of Thames River in London. Each horse is a hybrid — half animal, half oil pump. 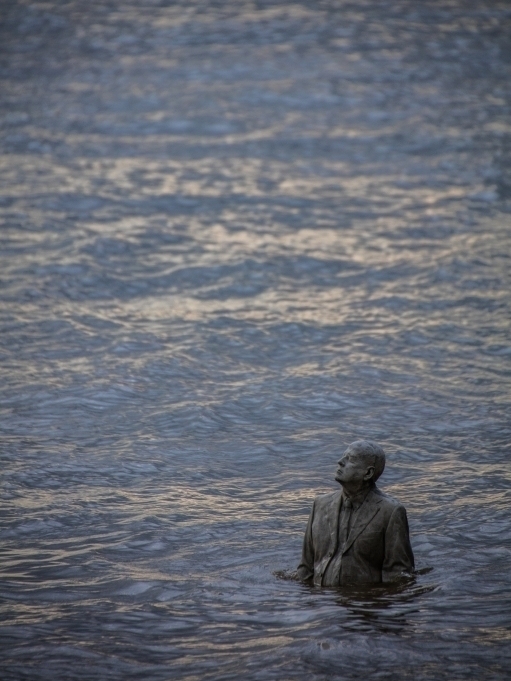 Of the four sculptures that comprise The Rising Tide, two are businessmen or politicians — including this one with arms folded and eyes shut tight. 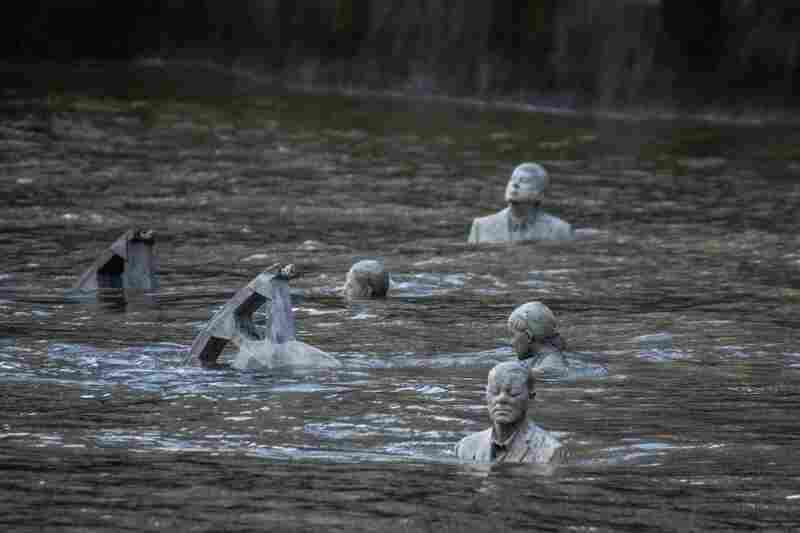 At high tide, the four sculptures of The Rising Tide are almost entirely submerged. 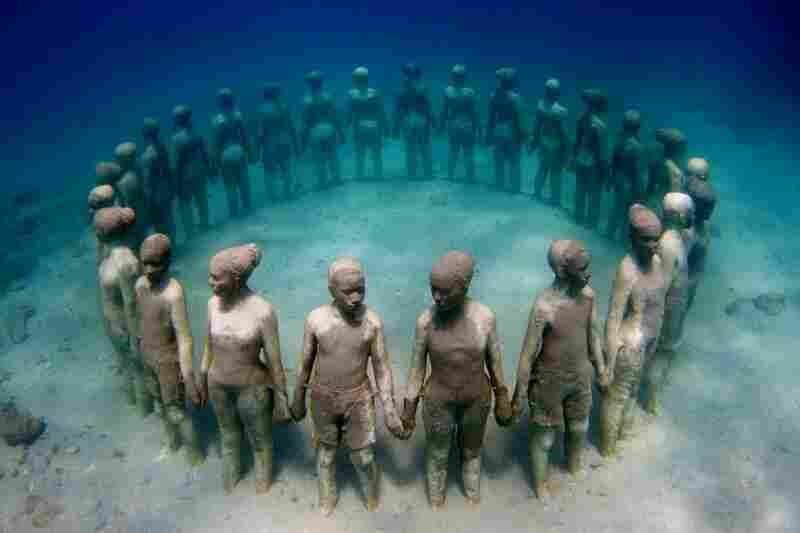 The Silent Evolution, by Jason deCaires Taylor, in Cancun, Mexico. 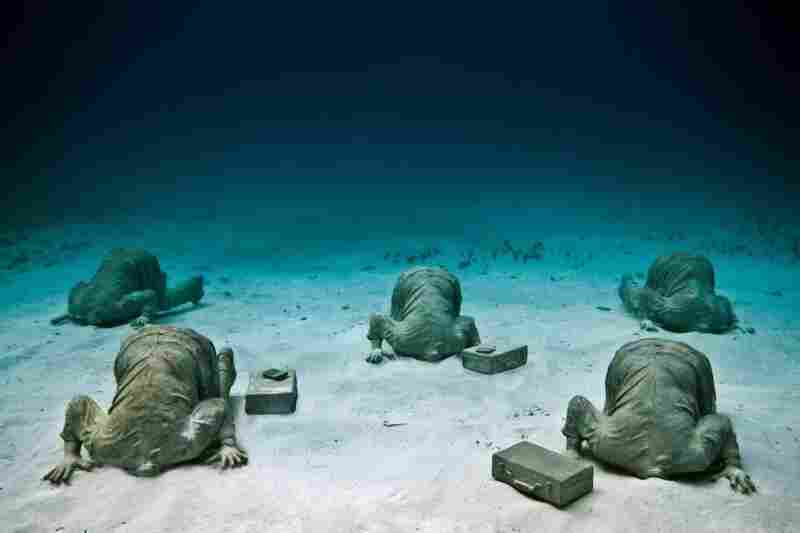 The Silent Evolution, by Jason deCaires Taylor, off the coast of Cancun, Mexico. 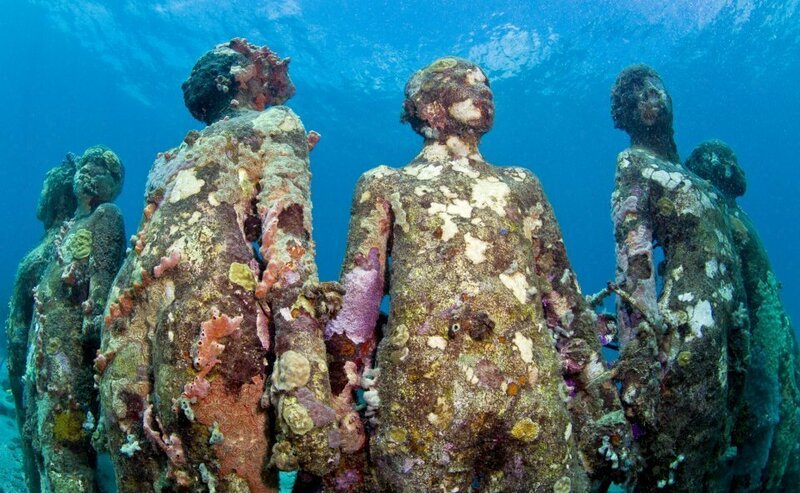 Inertia, by Jason deCaires Taylor, in Punta Nizuc, Mexico. 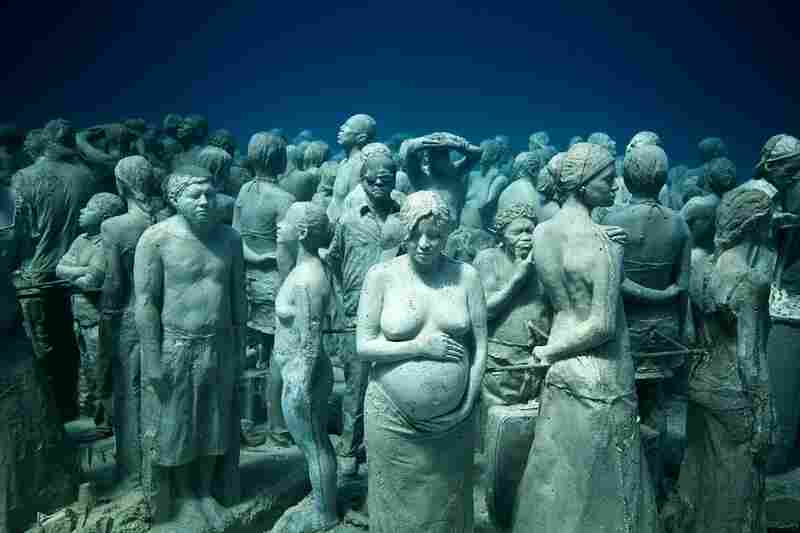 Vicissitudes, by Jason deCaires Taylor, off the coast of Granada. 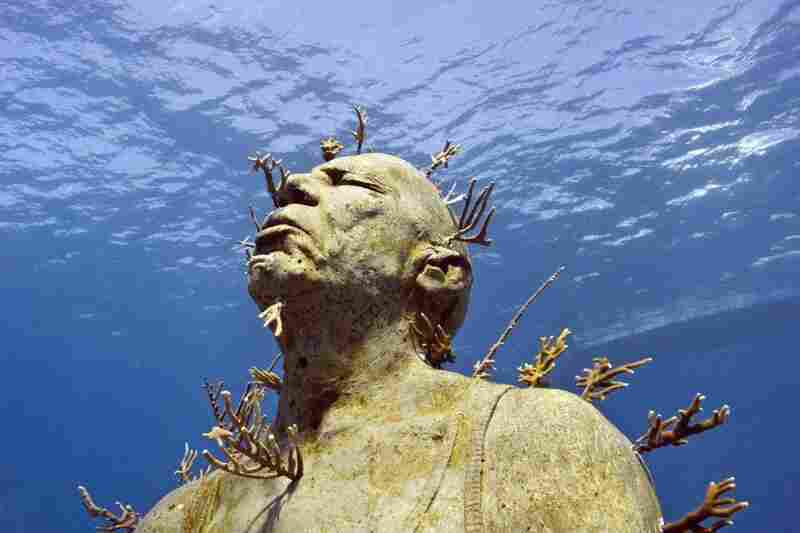 Man on Fire, by Jason deCaires Taylor, off the coast of Cancun, Mexico. 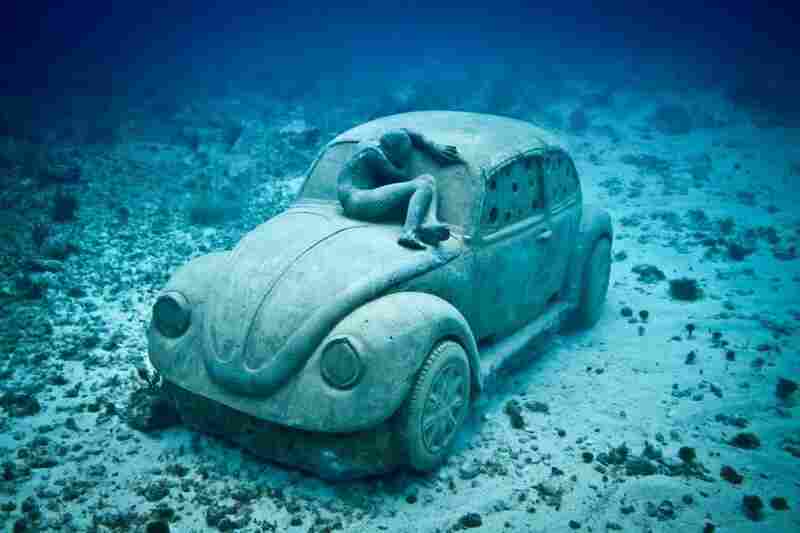 Anthropocene, by Jason deCaires Taylor, off the coast of Cancun, Mexico. 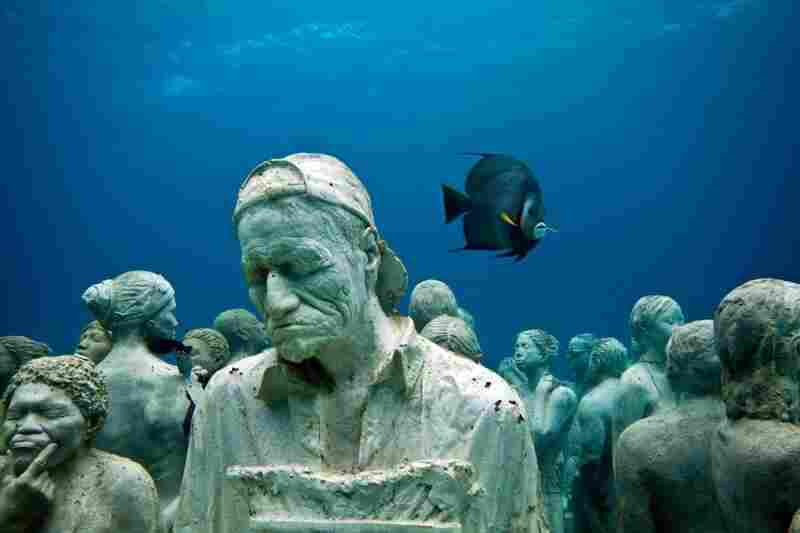 The Banker, by Jason deCaires Taylor, off the coast of Cancun, Mexico. You probably never will see most of Jason deCaires Taylor's public art projects firsthand — at least, not without goggles and fins. 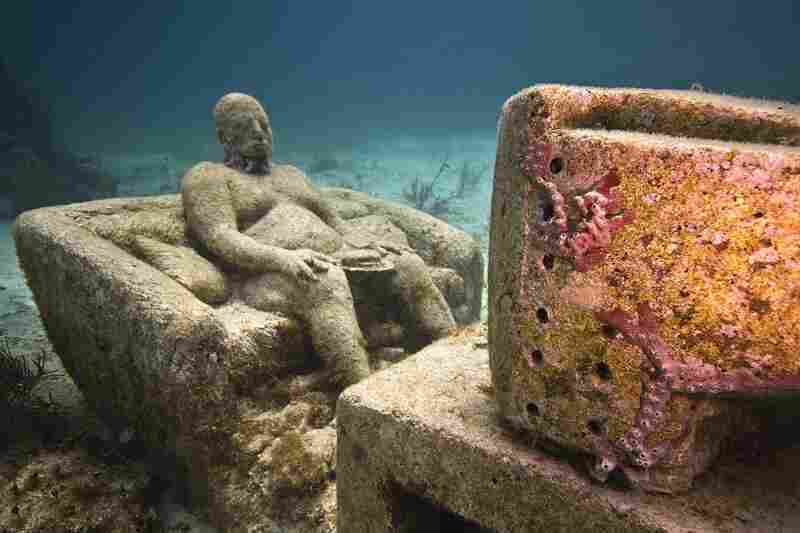 Most of his sculptures stand at the bottom of the sea. His life-size statues — ghostly figures of men, women and children — seem to walk the ocean floor as they hold hands, huddle, even watch TV. But his latest art installation is an exception: You can fully see it (if only twice a day). 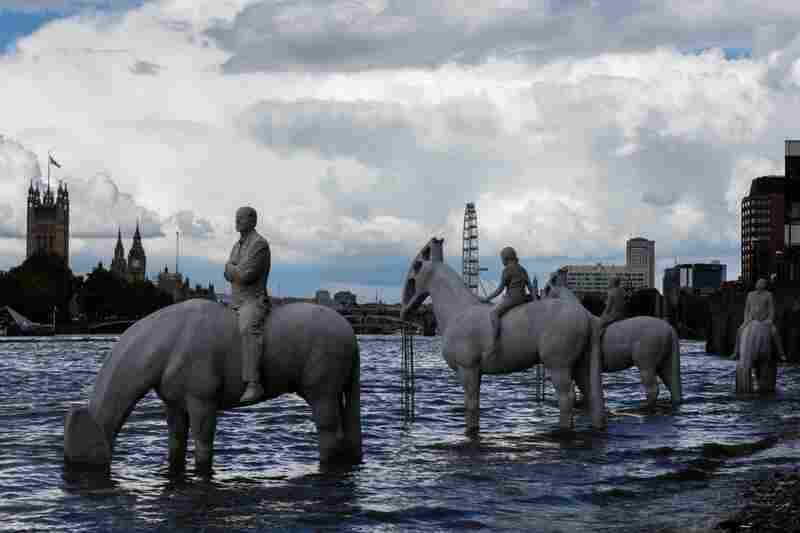 The Rising Tide, a set of four horseback riders standing in the river Thames in London, is completely visible only at low tide, when the water recedes. As he tells NPR's Scott Simon, his style gives rise to a curious fact: Between the elements, the tides and the life that grows up all around them, his works are never quite the same from one moment to the next. One of the suited men at the heart of Taylor's The Rising Tide — within feet of being subsumed. They're also in a very tidal zone, so there's 7 meters of tidal water that rises and falls twice a day. And so, depending on what time of day you visit them, sometimes almost concealed, and sometimes they're completely revealed by the water. It's very different, obviously, from normal public sculpture. I have to use materials which obviously don't pollute in any way, that are friendly to the marine life. They're also durable. The idea, especially with a lot of the tropical pieces that make artificial reefs, is that they're going to be around for a very long time. Obviously corals, hard corals, can take ages to really get established. So all the materials are very much with that in mind. And they're very much permanent, and very much fixed in place. It works in both ways. I mean, obviously they're all designed to change and evolve in the ecosystem where they're placed. And sometimes that provides spectacular results. You know, we get sort of pink and purple corals and sponges and fire coral and tunicate — all these amazing things growing on them, morphing them. That only adds to them: They really sort of then become alive. But also, you're in this really kind of difficult environment; you're in the sea. So, in tropical areas you get big hurricanes, you get surges of waves. And so with that in mind, you really have to sort of program them so they're fixed and stable, and that can be a challenge. Taylor's Vicissitudes, after it began to accumulate coral. I think you have to make a conscious effort, obviously, to go there. I mean, part of my challenge, and one of the things I'm most interested in showing is, you know, to most people the sea is this sort of hidden, concealed world that, when they look at, they just see a blue horizon, whereas it's actually a spectacular place underwater — it's this marvelous world that we have on our doorsteps. And I don't think that's fully understood or appreciated. I want my work to be a kind of portal or an entrance for people to get to know more about the sea, and obviously it's in peril from many different threats at the moment. And I really want to draw attention to that.